Choy sum always reminds me of Hong Kong, SIngapore, and Malaysia where I used to live many years ago. I used to eat this wonderful Chinese vegetable all the time. 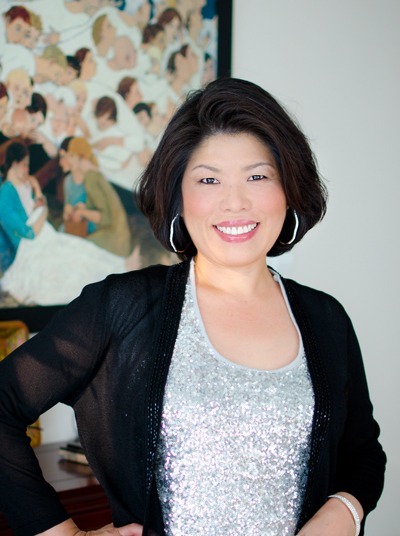 I am so glad that I found Choy Sum at the Asian grocery store in my neighborhood. The best way my family like to eat Choy Sum is with garlic sauce. 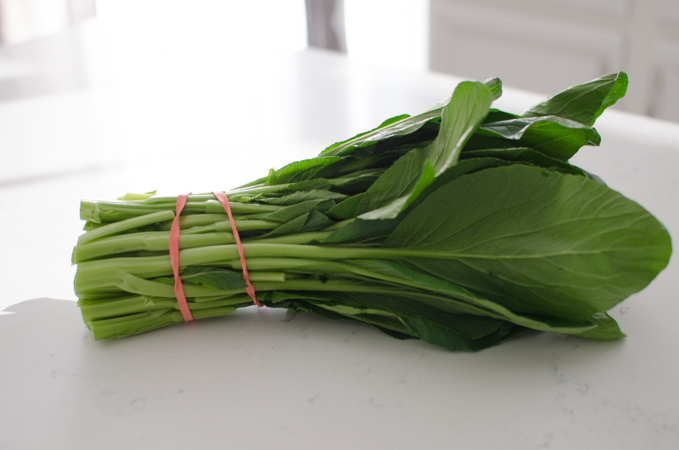 Once your green is blanched to tender, the sauce only takes less than 2-3 minutes. 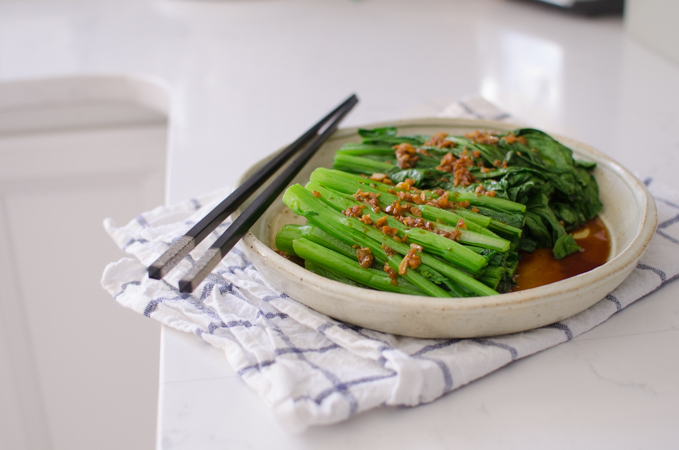 Simple yet delicious, you can enjoy this nutrition packed green vegetable in the best way you can taste. You will need to blanch the greens in the salted water for about 2 minutes. Blanch with the stem side first, then immerse the leafy part of green. 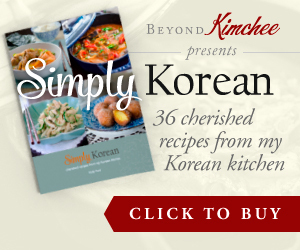 That way you will have evenly blanched Choy Sum to enjoy. I like to cut them in half when they are too long. This makes it easier to serve. 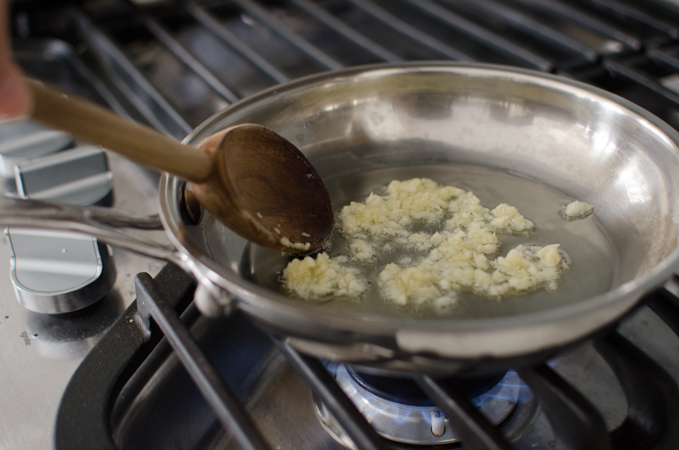 For the garlic sauce, saute minced garlic in oil until fragrant. Add soy sauce, a little bit of water, and sesame oil. The quickly pour over the greens. That’s it. How simple is that? 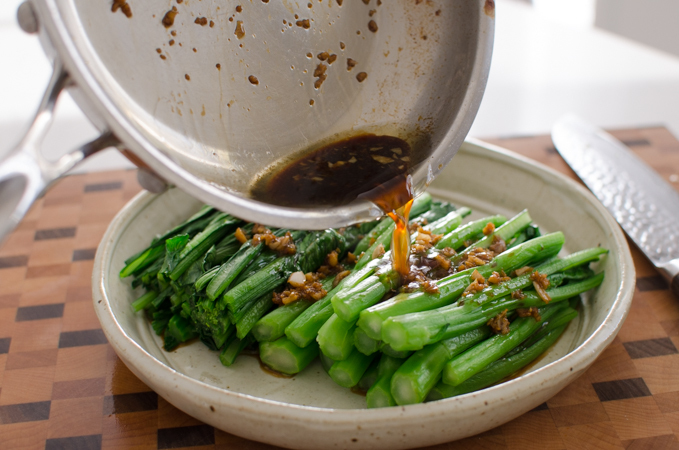 The garlicky fragrant sauce is irresistible and I can’t help keep adding the greens into my mouth. Now that is very good thing. Choy Sum can go with any Asian dish. 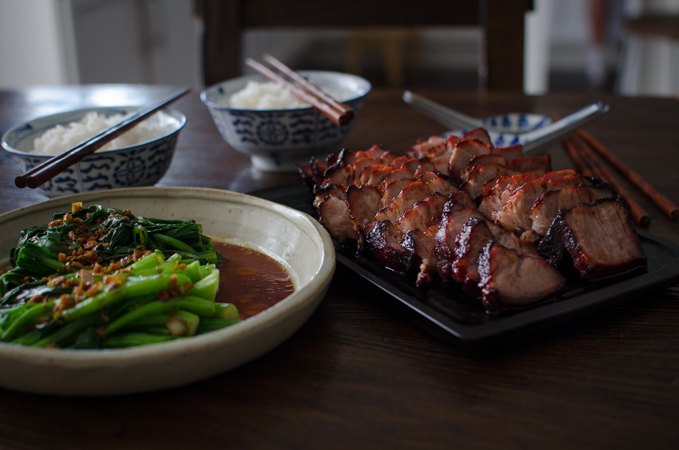 I made Char Siu, the Chinese BBQ pork to go with. I can assure that this ultimate Chinese (Cantonese) dinner was deeply appreciated by my family. Delicious~!!! Bring a pot of water to boil and add some salt. 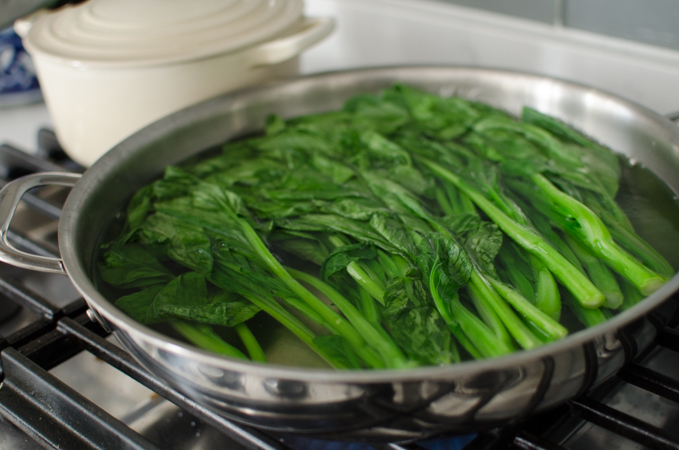 Add the stem part of Choy Sum first into the boiling water, wait for 30 seconds, then add the rest of leafy parts into the water. Blanch the greens for about 2 minutes or until crisp soft. Drain the greens to the strainer. 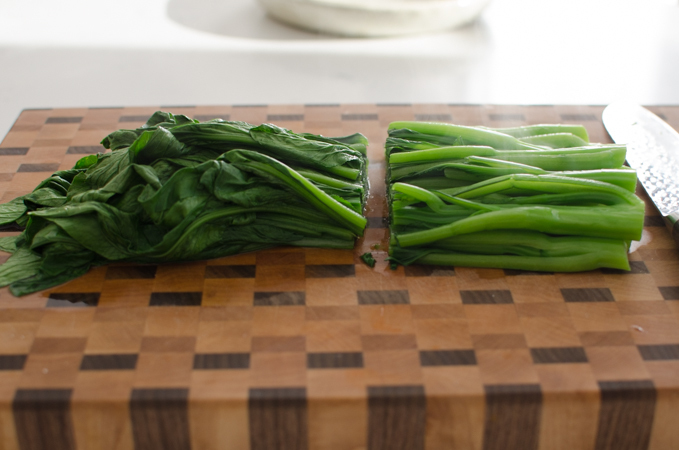 Arrange the greens on the cutting board and cut them in half lengthwise. Transfer the greens in a serving dish. Heat oil in a small skillet over medium heat. Saute garlic until fragrant. 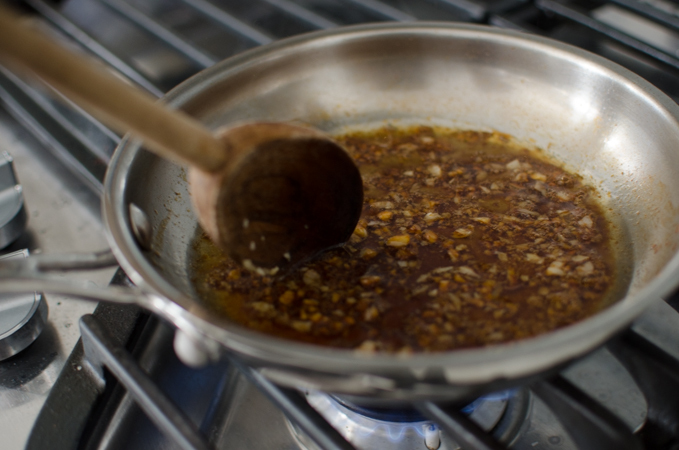 Add the soy sauce, water and sesame oil; stir well. Remove the skillet from the heat and pour the sauce over the greens. Serve warm. I don't think I've ever had Coy Sum. I live close to a good Asian market, so I should look for it. Love garlic sauce, so this dish is for me! What a yummy meal! 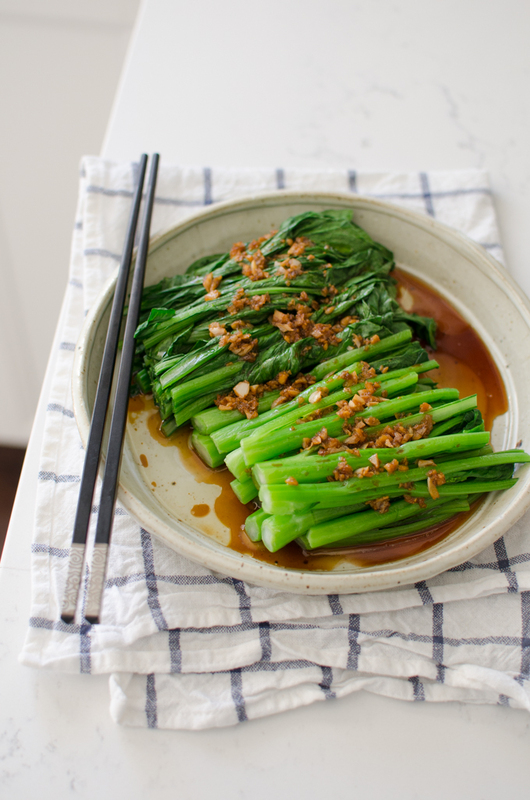 Choy sum with garlic sauce is definitely a favourite.